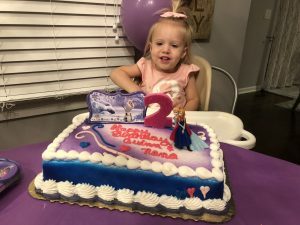 my dad flew home to celebrate Quinn’s 2nd birthday for a few short hours before heading back out to Kansas City via overnight bus. 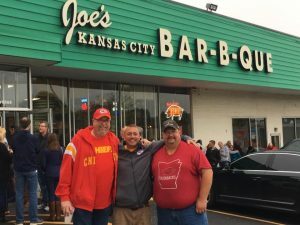 While he was on his 14 hour journey via greyhound bus, our friends Marty & Randy were presenting custom made pens, made by Kevin Cattlett, to the warriors at Joes BBQ. 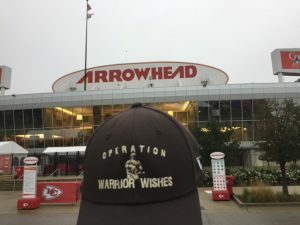 Marty Burnett, Randy Lusk & their families have gone above and beyond to help us make Warrior Wishes come true in Kansas City since 2013. 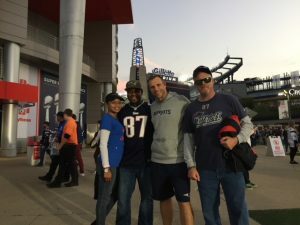 They are all huge military supporters and look forward to meet the warriors every year! We are very thankful for their support! 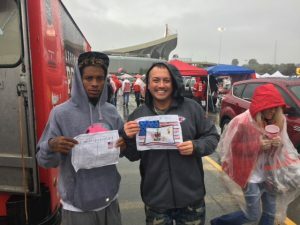 This year we had the honor of hosting Army SSG Josh Hays & Army Veteran Carlos Lind at the Chiefs game. 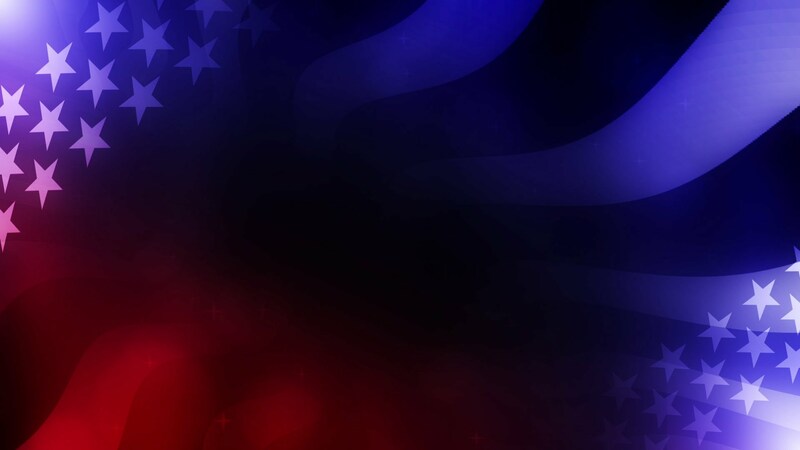 Originally we had planned to host Army Sgt Matthew Horton & his wife, Army Sgt Jessica Horton. But unfortunately they were unable to attend so they sent Carlos & his son to attend in their place. After a quick layover in St Louis, My dad’s overnight bus arrived in KC at 7:25am. 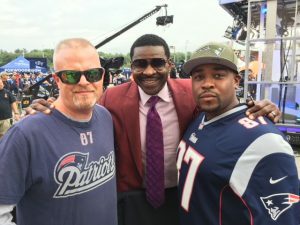 He grabbed a quick Uber ride to the stadium to meet the warriors and Marty at the “Munce Tailgate” – another of our Kansas City traditions. Unfortunately, the pouring rain that went on and off all day, certainly didn’t make things easy. But NOTHING stops us from making Warrior Wishes come true! 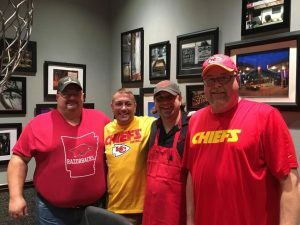 Once again, our ambassadors Marty and Randy along with their wives Tracy & Cassie, went above and beyond to make all of our Kansas City Warriors feel extremely special! My dad enjoyed the opportunity to meet Carlos & to see Josh again. Josh was one of our original Bears warriors in 2012 and was one of the featured warriors in our ESPN video. He has since moved to Kansas City. It’s always great to catch up with old friends! 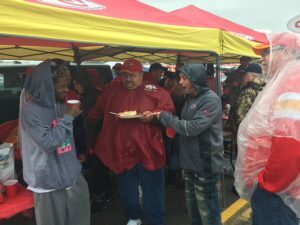 After a couple of hours of food and fun in the rain, everyone made their way inside Arrowhead stadium. 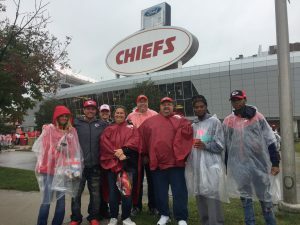 Unfortunately, The rain showers continued the entire game too… but thankfully the Chiefs turned In one of the most impressive defensive efforts of the year A pick 6, a couple fumble recoveries and four sacks led to the dominating 30-14 win over the Jaguars to keep their undefeated season alive! 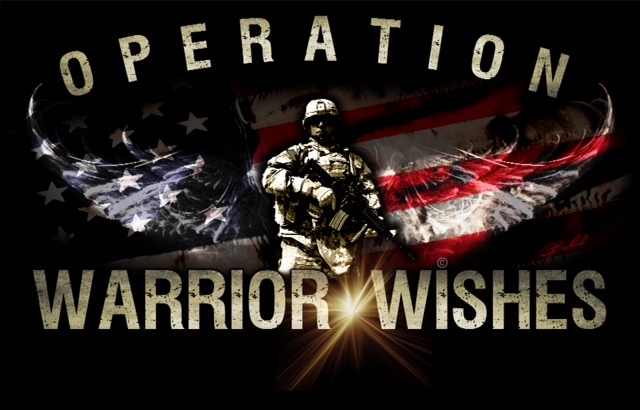 Operation Warrior Wishes would like to thank Marty, Randy, Tracy & Cassie for once again helping to provide an unforgettable experience to the warriors. We also want to thank Kevin & Jeff at Stoney Creek Hotels for donating rooms for the warriors. Most importantly, thank you to Josh Hays, Jessica Horton, Matt Horton and Carlos Lind for your service and sacrifices to our country! The fun continues after the game, as Marty & Randy organized a Warrior Wishes “Alumni Dinner” at Buffalo Wild Wings. 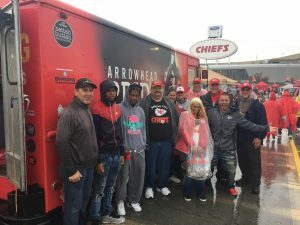 The group had the opportunity to dry off and meet up with some previous Warrior Wishes Chiefs game guests. 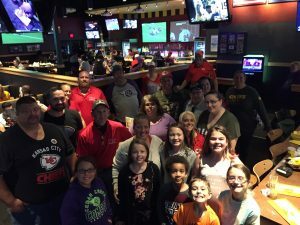 Everyone had a great time catching up with each other over some delicious wings! 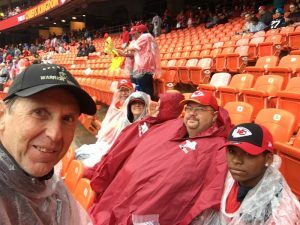 Eventually my dad made his way over to the Kansas City Airport for a good night sleep & flew out to New Orleans to make Warrior wishes come true at Monday night’s game! Stay tuned! 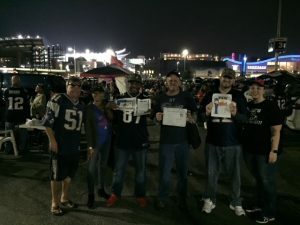 Game 14 – The New England Patriots Make Warrior Wishes Come True!